I could watch and listen to Dorothy Dandridge OR The Nicholas Brothers (Fayard and Harold) all day long… but when you put them all together, I’m ready to go well into the night. Words can’t tell you how much I love this type of entertainment – the dancing, the singing, the smiles… If it were a drink, I’d get drunk on it! In the video below (which I’ve watched at least 100 times in the last week), Dorothy Dandridge and the Nicholas Brothers perform Chattanooga Choo Choo. As I said a few days ago on Hollywood Yesterday’s Twitter page, I am in the midst of a glorious Dorothy Dandridge movie binge. With TCM, DVDs, and YouTube, finding movies that were once all but impossible to find is relatively easy these days. I’ve loved Dorothy Dandridge for YEARS – since I saw her in Carmen Jones on late night tv many, many moons ago. Finding her movies has been a bit of a challenge, but as I said, that has gotten a lot easier of late. 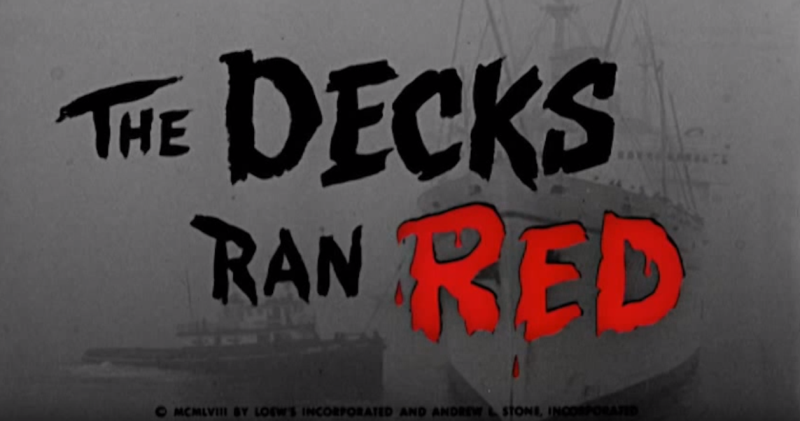 I recently watched The Decks Ran Red on TCM. When I saw it in the listing, I basically moved my entire day around to spend a few hours with Dorothy Dandridge. I honestly didn’t know what to expect from this film. To say I didn’t have my hopes up is an understatement. I don’t mind so much that you don’t hear about the movie often (I’ve found some of my favorite movies aren’t at all well known or “popular”). I also didn’t mind that the cast wasn’t filled with household names. Again, that often means buckus. Maybe my knee-high hopes and expectations came from the fact that this movie had BOTH of the so-called strikes above going for it. You seldom (if ever) hear about this movie and the cast doesn’t exactly read like a who’s who among film stars. Aside from a few stars, even the most devoted film buffs would need to look up a few names. I grabbed my popcorn and tea as a few of my cats found their favorite spots in the den. I settled into my favorite chair and readied myself for one of my favorite pastimes in the world – watching an old movie. I tried to push my low expectations aside… then one of the worst opening graphics I’ve ever seen in my life appeared on the screen! Someone apparently thought the splash of red in the word RED (as well as the drops of “blood”) would be pretty cool in an entirely black and white movie and graphic. Heck, they may have even called it “the bee’s knees.” It wasn’t. I think even my cats were astounded. Fortunately, the ugliness disappeared as fast as it came. As a Dorothy Dandridge fan, I’m delighted to say the movie was good – darn good, in fact. It overcame the low expectations and ridiculous graphic right off the bat. By the end of the very first scene, I knew this would be a fun ride. You know how some movies take a while to win you over – sometimes as much as half the movie? The Decks Ran Red was one of those delicious rare treats where you know from the first scene that you’re about to have a great time. There was suspense, outstanding acting, and a healthy dose of intrigue. Funny how you forget the word intrigue even exists until a great book or film comes along and reminds you how much you love it. 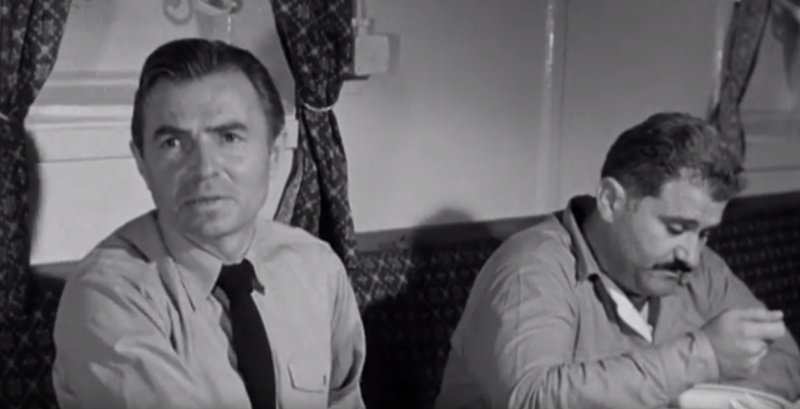 James Mason (possibly best-known from starring alongside Judy Garland in A Star is Born) is outstanding as Captain Edwin Rummill. It’s a role that would have been easy to “overplay” but Mason brilliantly stayed allowed the writing to be the star. I can’t say enough about him – he was just wonderful. You found yourself pulling for him in every conceivable way – ready to fight anyone (aside from Dorothy Dandridge, of course) who gets in his way. PLOT: Captain Rummill has been made a Ship’s Captain for the first time in his life. Very eager to prove himself, he sets out to do right by his ship and crew. 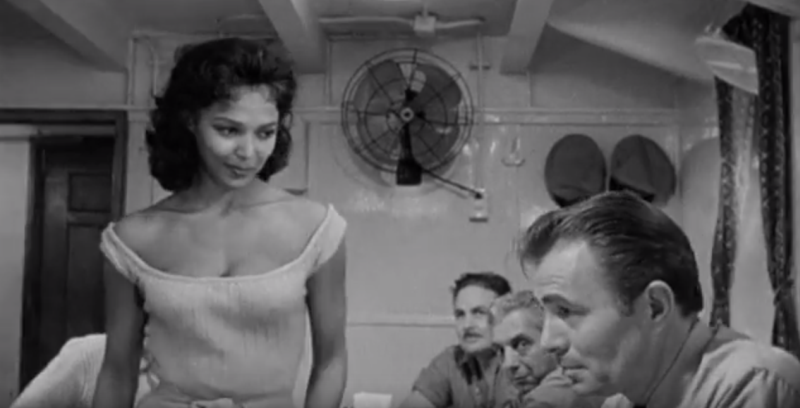 He’s a great man, but is (of course only human), so he can’t help but notice the cook’s gorgeous wife, Mahia (played perfectly by Dorothy Dandridge) when she steps on board. He knows she will, undobutedly, cause trouble on a ship filled with (even more human than the Captain) men, but he doesn’t intervene. Of course, trouble arises for Mahia and her husband. There is more trouble than this aboard for the Captain. A few scoundrels on the crew plan and launch a violent mutiny. Broderick Crawford (the leader of the scoundrels) and Stuart Whitman (his number one guy) give wonderful performances, but make no mistake about it, James Mason and Dorothy Dandridge are the stars of this surprisingly good film. One of the things I really appreciate from the film is the fact that Dorothy Dandridge’s character played a pivotal role in the ending. She wasn’t, by any means, window decorations in this movie. She was vital to the entire movie and, as a huge Dorothy Dandridge fan… I applaud it long and loudly. Took me about half the movie to realize that I know him from everywhere. Seriously, his filmography and guest-starring roles are very impressive. The full episode of The Decks Ran Red is below. I think you’ll love it as much as I did. INTRIGUE… DOROTHY… what more could you ask for?! I began Hollywood Yesterday in 2005 (13 years ago!) as a means of keeping the wonderful, glamorous stars of The Golden Age of Hollywood or “Old Hollywood” alive and shining bright. I’ve always loved old movies – even as a child, I preferred watching Shirley Temple and Abbott and Costello reruns to the newer movies and I’d rather have spent an afternoon watching Westerns with my dad than doing just about anything. Over the years, my personal list of favorites has grown – but, make no mistake about it, my earliest favorites (Audrey, Barbara, James Stewart, Dean & Lewis, Abbott & Costello, Rita) are still among my absolute favorites. The frustrating thing is, I can’t whittle my list down! The thing is, when you love old movies and watch them with the vigor I do, you meet new favorites along the way. I only recently became really acquainted with Joan Crawford, for example. See, here’s the thing.. .to really appreciate a star, you have to have seen them in several roles and several movies. After my second Joan Crawford movie, she charged firmly into place among my favorites. And looked downright elegant doing so! The same thing happened years ago with one of my favorite actors, Glenn Ford. I’d seen him in The Violent men and, although I really liked him, I wasn’t ready to call him a favorite. Then I saw him in Gilda… and there he went – flying into place. Rita? Heck, she’s always been there. I recently had a particularly gorgeous actress/singer land firmly among the promised land – Dorothy Dandridge. I had, of course, heard of Dorothy (who hasn’t?!) and most certainly knew that she was a ridiculously beautiful lady. I, somehow, had never seen her in a single film she was in. Not one. Now that I have, she has found a home among others who have a special place in my heart. Dorothy Dandridge was born November 9, 1922 in Cleveland, Ohio. Her mother was an entertainer and her father was a minister. Her family moved to California, where they had hopes of more opportunities – perhaps even in film. Sadly (hello, understatement), this was during a time in history when people of color didn’t receive the respect or kindness they deserved. As both an avid Old Movie fan and History Buff, I despise reading about racism or the struggles men and women went through and the nastiness they endured. However, it is a part of history, so it has to be faced… even if it’s with a tear-stained face. What I try to concentrate on is the drive, determination, faith, and inner beauty that these men and women had that saw them through unspeakable ignorance. The fact that names like Dorothy Dandridge, Jackie Robinson, Butterfly McQueen, Harry Belafonte, Sidney Potier, Harriet Tubman (and so many more!) are fondly remembered when the vast majority of people who were ugly to them are long forgotten makes me smile -and I’m not even sorry if that sounds ugly. In 1954, Dorothy appeared in the movie and role she is most associated with – Carmen Jones. She was so fantastic in this role, that even in a society still trying to find its humanity, she earned an Academy Award nomination. Unfortunately she lost out to Grace Kelly for her role in The Country Girl. You’ll get arguments from people on both sides of the fence on this one, but as someone who has seen both movies, and as someone who very much likes BOTH actresses, I have to say that I believe the Award should have gone to Dorothy. Grace Kelly was wonderful in The Country Girl but Dorothy was on a whole other level in Carmen Jones. Yes, it was phenomenal to have been nominated but she could have (and in my opinion should have) won. Ironically, in spite of this nomination, she didn’t get another role until Tamango (an Italian film) in 1958. She went on to make six more motion pictures, including standouts Island in the Sun in 1957 and Porgy and Bess in 1959. She was only 42 when she died in 1965, with her last years being anything but glamorous. Many Dorothy Dandridge biographers and fans believed the actress suffered from depression and perhaps even bipolar disorder. To have overcome this AND the racism she faced all while looking like a smiling angel from above makes her one extra special lady. I’ve been reading a great deal about Dorothy the past few weeks, and have placed an order for two biographies to dive in even deeper. I’ll let you in on something that troubles me. She is almost always compared to Marilyn Monroe… or mentioned in some way or fashion alongside Marilyn. I understand, to a certain extent, trying to compare beauties when they resemble one another. In fact, I’ve often been intrigued by the similarities between Vivien Leigh and Hedy Lamarr and between Claudette Colbert and Helen Hayes – when they were around the same age. I can even get trying to gauge an actress’ popularity by measuring it against another star’s. However, Dorothy Dandridge CAN and SHOULD be remembered and celebrated all on her own. I’m excited by the number of classic movie fans I see on Twitter and Pinterest – and I love the fact that so many are very young…. with many twenty-somethings loving the Golden Age of Hollywood. I hope to see all of us listing Dorothy Dandridge in her rightful place, among the other beautiful and talented stars of her time. I certainly plan to do my part to help make it happen. After all, she fits perfectly among the list of other first-name basis ladies: Audrey, Rita, Barbara, Dorothy, Ava, Joan, Marilyn… just where she belongs – among the stars. My name is Joi (“Joy”) and I created Hollywood Yesterday as my personal tribute to Old Hollywood. It’s my effort to help keep the stars from Old Hollywood, Classic Television, and Old Radio Shows alive and shining forever. Old Hollywood was sheer magic and I see no reason for the magic to ever die. Read more about Hollywood Yesterday (and see my own favorites!) here. The Quiet Man is one of the most beautiful, entertaining, colorful, and perfect movies ever made. Two of my favorite stars (Maureen O’Hara and John Wayne) in one of my favorite movies? It doesn’t get much better than that! Rita Hayworth Picture of the Month!